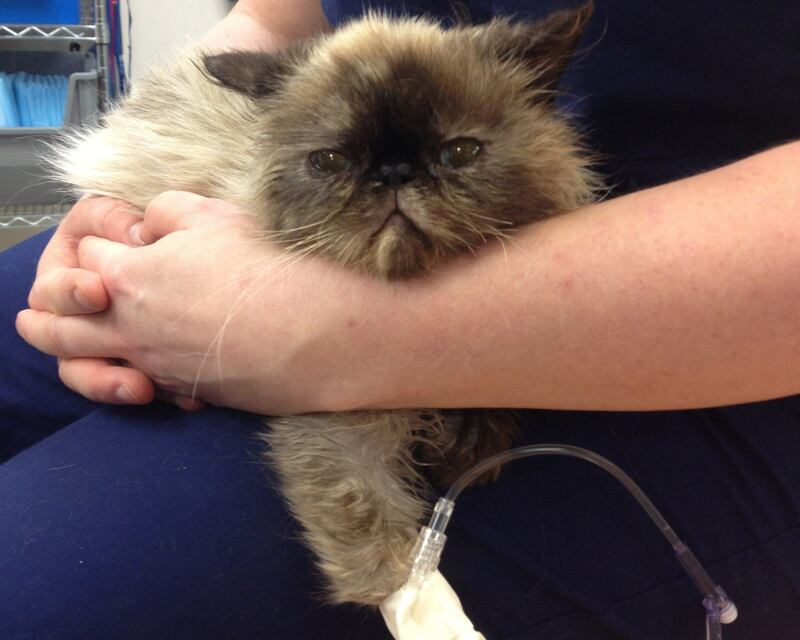 Squash, a Himalayan cat, was rescued by me (Dr. Buelow) after being turned in to a shelter. She was only about 2 at the time, but required a lot of medical care and nursing to get back to health after being kept in very poor conditions (presumably for breeding purposes). Well, after having her for a couple of years, I realized that poor squash had a serious problem. Her breath was terrible! Fortunately, I was able to take her in for dental care as soon as she noticed. I was flabbergasted and somewhat embarrassed to find out that she was suffering from severe periodontal disease. How could I, as a veterinary dentist, not have been aware of this? I think she is a perfect example of how good animals are at hiding signs of oral disease. At Squash’s dental appointment, her x-rays showed that she had lost over 50% of the supporting bone around all of her teeth. Most of it was due to her breed. 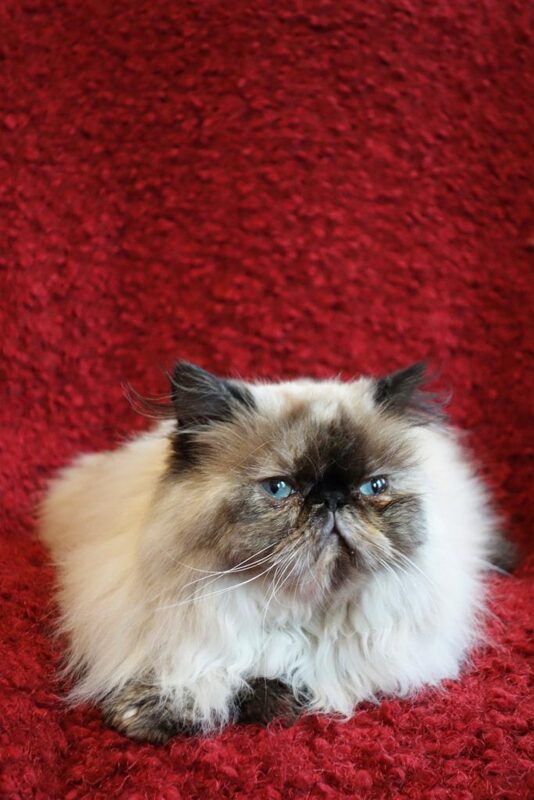 Squash is a Himalayan, and as such, was bred to have a short face. While some find this cute, it often results is serious problems, such as dental disease due to crowding of the teeth, breathing issues, and eye issues. While I rescued her and love her very much, I advocate against breeding animals for the “short face” look. Squash receiving fluids prior to surgery. Due to the severity of Squash’s periodontal disease, all of her teeth had to be surgically extracted. Although it seems dramatic, it was essential to remove the severe infection and inflammation in her mouth to protect her overall health. There are well-known correlations between periodontal disease and general health. The surgery to remove her teeth went well, and Squash got to go home the day of surgery with some pain medication. She remarkably recovered within a couple of days. 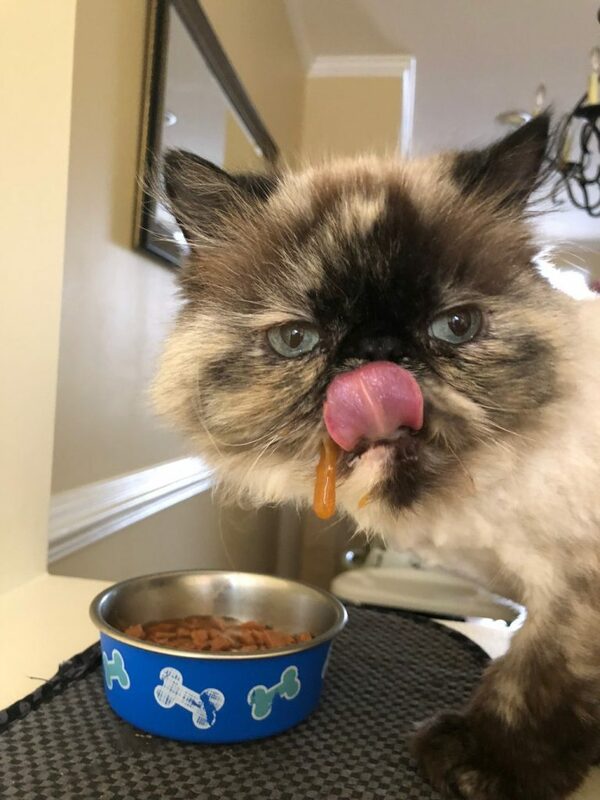 Although she had a little swelling right after surgery, she started eating right after getting home after her surgery (not much keeps her from eating!). How does she eat without teeth? Well, believe it or not, Squash eats even better than before because all of the pain and infection in her mouth are now gone. She happily eats dry and canned food (and the occasional treat of course!). Squash clearly feels better than she has in a long time and she is back to being her lovable, huggable, adorable self. I love my squishy squashy!! !